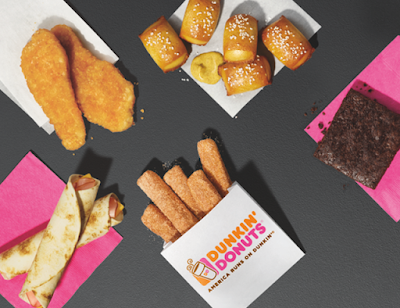 As snacking increases, Dunkin' Donut leans into the trend with the new Dunkin' Run menu of on-the-go snacks priced at $2 each. - Donut Fries - Croissant-style donut sticks tossed in cinnamon sugar and served warm. These were introduced earlier this summer and include five sticks per order. - Ham & Cheese Roll-ups - Ham and cheese rolled up in flour tortillas. You get two per order. - Pretzel Bites & Mustard - Five bite-sized pretzels topped with salt and served warm with spicy brown mustard for dipping. - Waffle Breaded Chicken Tenders - Two chicken tenders coated with sweet waffle batter. - Fudge Brownie - Dunkin's first nationwide gluten-free bakery product is an individually-wrapped (to prevent cross-contamination) fudge brownie. The chain has also brought back the S'mores Donut for a limited time at participating locations nationwide. It consists of a yeast shell donut with a center of toasted marshmallow-flavored filling, topped with chocolate icing, graham cracker crumbles, marshmallow-flavored pieces, and Hershey's chocolate.